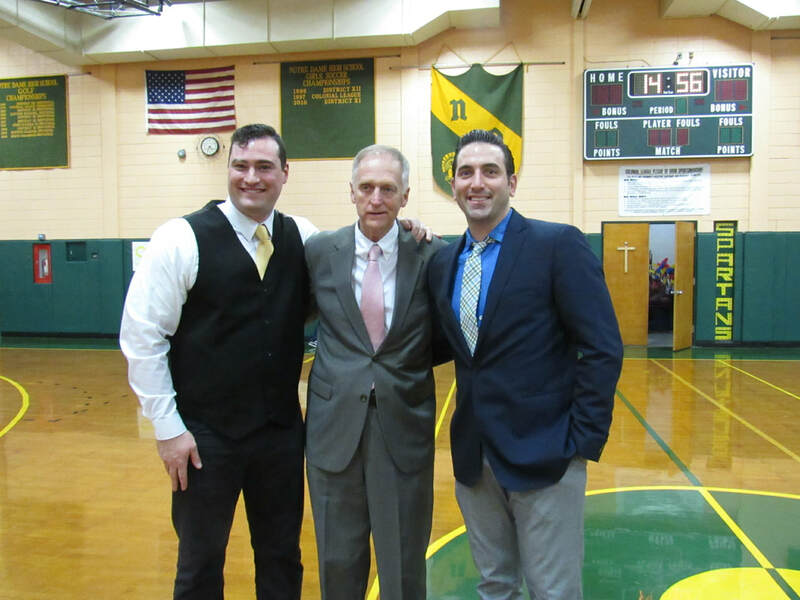 ​Jamey Bercier is the all-time leading scorer in Notre Dame boys’ basketball history with 1495 points. Along the way, he was a four-year starter and unprecedented four-time team MVP on squads that won three straight District 11 championships from 2005 through 2007 and were ranked in the state’s top ten. Jamey was named All-Area all four years, including Player of the Year and Associated Press All-State during his junior season when he averaged 15 points, 12 rebounds, and 4 blocked shots per game. As a senior, he again carried those same averages and was selected as both a Perryman and VIA All-Star as well as earning Notre Dame’s Scholar-Athlete Award, the Kodak Young Leaders Award, and the United States Army Reserve National Scholar/Athlete Award. Jamey was the Class of 2008 Valedictorian and accepted a full scholarship to Chestnut Hill College where he played one season before transferring to DeSales University to be closer to family in their time of need. At DeSales, Jamey became a three-year starter on teams that won three regular season Freedom Conference titles, two Freedom Conference Championship titles, and reached the NCAA Division III Sweet Sixteen in 2009 and the Elite Eight in 2010. Jamey maintained a constant place on the Academic Honor Roll throughout his career and he graduated with a degree in Biology. Eric Whitman was Notre Dame’s first multi-sport professional athlete. He received three contract offers from the International Basketball Federation (FIBA) and chose to play for France in 2009, and then for the Jersey Express in the American Basketball Association (ABA) in 2011. Eric also played six years of professional golf, highlighted by winning the 2013 Titleist/Acushnet Mid-Atlantic Team Championship. At Notre Dame, Eric was a three-year starter in both sports. In basketball, he was named MVP twice and All-Area three times. He set school records for points in a quarter (24), rebounds in a game (23), steals per game (5.2), and points in a season (720) which led the entire Lehigh Valley on his way to 1142 career points in just 57 games. In golf, Eric was a three-time MVP and All-Area honoree and earned All-Colonial League first-team after he set league and school records with 8 birdies and an eagle in a single round. Overall, Eric received 12 Athlete of the Week awards, was a Colonial League Academic All-Star, and the recipient of ND’s Spartan Award, Outstanding Senior Athlete Award, and Gregory Moyer Spirit of the Game Scholarship. Eric lettered in both sports all four years at Moravian College, earning All-Conference twice in golf and once in basketball. His golf team won the conference title in 2006 and was ranked in the national top ten every year, and his basketball squad made it to the NCAA tournament in 2008. Eric graduated with a degree in Business with minors in Economics and English. 2013 - The 1987-88 Boy's Basketball team:Carlo Roberts, Rob Peters, Nick Sorrenti, Brian Kloss, Ken Shann, Adam Adlemann, P.J. Christian, Mike Stirr, Tom Lester, Chris Lovecchio, Leon Perkowski, and Head Coach Mark Bartkowski.